Oil prices have defied bullish efforts to curb oversupply. Here's our take on why. I have a friend... let's call him Larry. Let's just say, Larry is not a fan of taking risks. He likes his reflexes fast, his cars slow, and his financial markets secure for the long haul. So, when Larry called me up at the beginning of this year to say he's boarding the highly-volatile crude oil market, I was appropriately stunned. But here's the thing. He was still being "wary Larry," meticulously weighing the risks. It just so happens they seemed to pale in comparison to the overwhelming rewards. See, at the time, oil bulls had been served the ultimate bullish advantage on a black-gold platter; namely, the first major oil supply cut in eight years. To recap: On January 1, the long-awaited agreement between OPEC and its major exporting partners like Russia to curtail production by 1.8 million barrels a day went into effect. Yet -- instead of rallying, crude oil prices did the total opposite. After a brief spike, first prices went sideways, and come February, oil prices lost their grip on an 18-month high, falling in a down-up-down series to a 10-month low on June 20. In fact, since February, oil prices have plummeted 20% to enter official bear-market territory, enduring their worst first half-year in two decades. Wait. Now -- six months later and 20% lower in price -- the "supply deal's effectiveness" is questioned? What about before? See, we believe oil's selloff was going to occur despite OPEC's historic cuts. The reason being, the oil cartel does not control the long-term oil price trend; investor psychology, which unfolds as Elliott wave patterns on oil's price chart, does. "Repeating: The jury is out, but my working assumption is that wave (A) of triangle wave ((4)) has concluded. If so, the market should trace out a large zigzag for the wave (B) decline that retraces at least 55% of the wave (A) advance." It's safe to say, next time wary Larry decides to participate in the oil market, he may think twice about relying 100% on fundamental, news-led analysis as his guide. 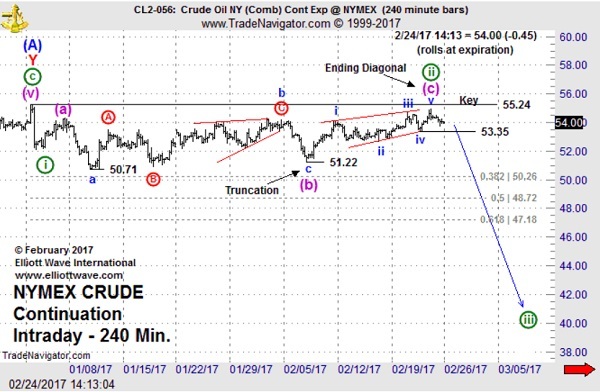 Adding Elliott wave analysis into the mix may just give him -- and you -- that objective, risk-limiting insight into crude oil's next big move all traders look for.